It's the big Hollywood blockbuster season, so while we take a quick break away from E3, let's delve into one of the most popular forms of Hollywood blockbuster, the superhero movie! LEGO Marvel's Avengers actually is a double dose of Avengers goodness, retelling the plot of both Avengers films. Though the game was originally released earlier in the year, there's no such thing as being too late to this Marvel superhero jamboree. Here's the SuperPhillip Central review of LEGO Marvel's Avengers. A LEGO game to marvel at? DC or Marvel. As a child of the 90's, it wasn't as big of a battle with kids my age which one was better as, say, Nintendo or Sega. However, the struggle, as some say, was indeed real. While I loved Batman and still do to this day, the collection of superheroes that Marvel Comics has established over the years always appealed to me more. LEGO has had multiple successes taking both DC's and Marvel's characters and putting them into game form. Now, LEGO has returned with another chapter in its Marvel line of games with LEGO Marvel's Avengers. As someone who hasn't seen any of the Marvel Cinematic Universe films yet, I was understandably confused by the organization of the plot of the game. 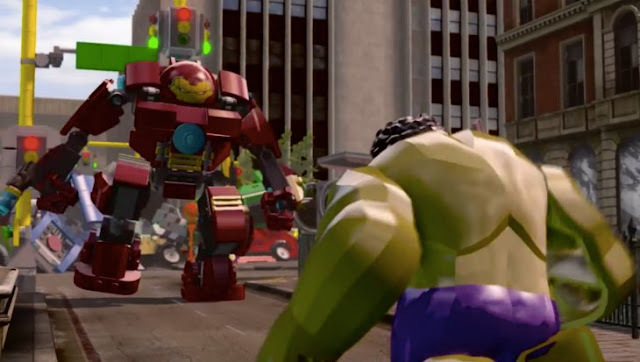 LEGO Marvel's Avengers's main source for providing the story elements for the game itself come from the two Avengers movies. The slight bouncing around between Marvel's Avengers and Age of Ultron was a bit perplexing, but now after reading more about the movies, I know that the game starts with the opening of Age of Ultron before delving into a flashback from Captain America: The First Avenger, then goes to a more orderly structure, going from the first Avengers movie to Age of Ultron. Looks like the gang is all here and ready to rock and roll. LEGO Marvel's Avengers takes the humor of the LEGO series in the form of various sight gags and overlays them with lines directly from the films the game is based off of. One curious running gag is characters at various points of the game slurping from a strawberry milkshake. While that fell flat for me, other instances provide plenty of comedy, especially for the young ones. The lines used from the movies range from too quiet to too loud. They're imperfectly used and imbalanced. It's nothing overly jarring, but I made sure to have the volume up a little bit to compensate. Most LEGO games released in the past few years have taken on a fully explore-able hub, filled with usually simple environmental puzzles (e.g. have Thor use his lightning to charge a panel which then opens a chest revealing your prize) or a series of environmental puzzles that unlock Gold Bricks. LEGO Marvel's Avengers has more than a handful of these instead of just one overworld hub. However, while there are different vistas and locales to visit, such as Asgard, Tony Stark's mansion in Malibu, Washington D.C., and more, Manhattan still remains the largest hub with the most things to do. A relief to me was that the flight controls for characters like Iron Man are vastly improved over the last LEGO Marvel game. Makes jetting around this game's hubs much more enjoyable. These hub areas are a lot of fun to explore. When you're not looking for Gold Bricks from doing various puzzling tasks, you can participate in races, initiated by pressing the confirm button whilst in near the starting line in the form of a ring (there are both ground and sky races to partake in, with the sky races being much improved over past games due to better handling with the flight controls); help fulfill various Marvel superhero and villain requests, which reward that character for use in Free Play; find various vehicle and character tokens; and help out famed comic book artist and storyteller Stan Lee out of some problematic predicaments. Everything is connected between a map-- that includes other hubs as well as the various fifteen levels of the game. The aforementioned fifteen levels that LEGO Marvel's Avengers possesses are nothing new to anyone who has played a post-2005 LEGO game. You move around contained stages, essentially destroying every object in the area with your Marvel character's fists or other form of weaponry, using specific broken LEGO pieces to form new structures to solve environmentally based puzzles. In the first run of a level, you won't be able to collect everything it has to offer. This encourages replaying levels through Free Play, which allows you to call in any unlocked Marvel superhero, villain, or other character to interact with level elements that your original characters weren't able to do on your first run of the level. Careful, Iron Man, this ain't no jolly green giant you're dealing with. 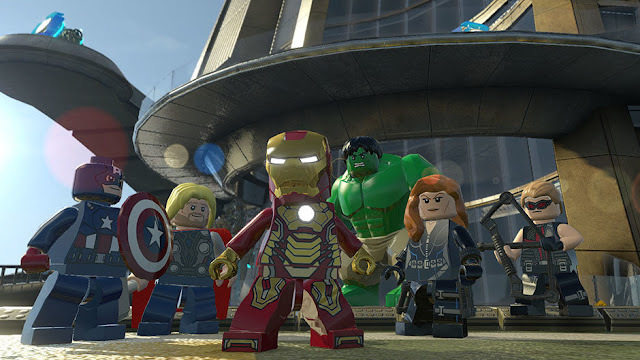 Each character in LEGO Marvel's Avengers follows the established LEGO formula, containing a specific power or ability. Some characters have multiple powers and abilities. For instance, Iron Man's red hot laser beam can destroy gold brick objects while Black Widow can use her cloaking ability to slip past security cameras and beams without being detected. It can be annoying switching between characters as much as you need to in Free Play, but thankfully, you have two characters in a level at the same time-- one you control and one the AI controls. Not one to run from a fight, Captain America simply lost his sense of direction here. However, you need not stick with an AI teammate if you do not wish to. 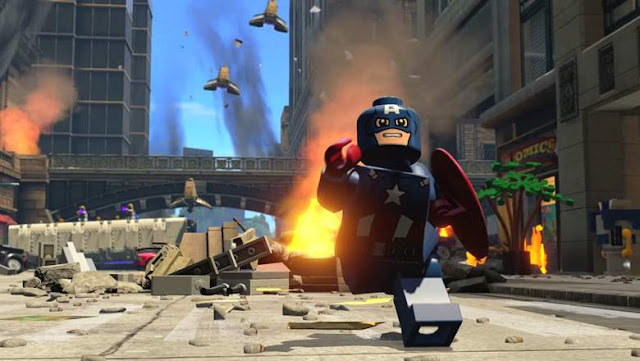 LEGO Marvel's Avengers brings the well loved cooperative gameplay to the LEGO series once again, offering local play for two players in one form of split-screen or another (the Wii U version offers the ability for one players to use the GamePad screen while the other uses the TV). Unfortunately, with the Wii U, PS3, and Xbox 360 versions, co-op results in some occasionally very sluggish frame-rate issues that are quite noticeable. Perform two-character combat moves to slightly alleviate the otherwise boring fighting in this game. The design of levels tries to keep players engaged, but it's a bit of a problem whenever the game throws in multiple enemies for you to dispatch. The combat in all LEGO games are extremely basic to the point of being effortless. Being a game for the family, particular young children, a character losing all their hearts just results in a loss of some LEGO studs, the currency of the LEGO series, an incredibly minor inconvenience at that. This means when you have segments of the game where you have to take on a boss or defeat upwards of 30 enemies in a row, the ennui definitely kicks in. There are 250 Gold Bricks to find-- many gained from discovering them through solving simple puzzles around the various hubs of LEGO Marvel's Avengers, while others come from completing the story missions, collecting enough LEGO studs in a given level, finding all 10 mini-kits in a level, and helping to rescue Stan Lee from some sort of perilous and compromising position. Then, there are the Red Bricks to find, 15 of them, that unlock bonus cheats, as well as all of the characters and vehicles you can unlock. If you're a fan of collecting stuff, and doing so in a fun way, you'll find a lot to love and enjoy with LEGO Marvel's Avengers-- just like any other LEGO game, really. 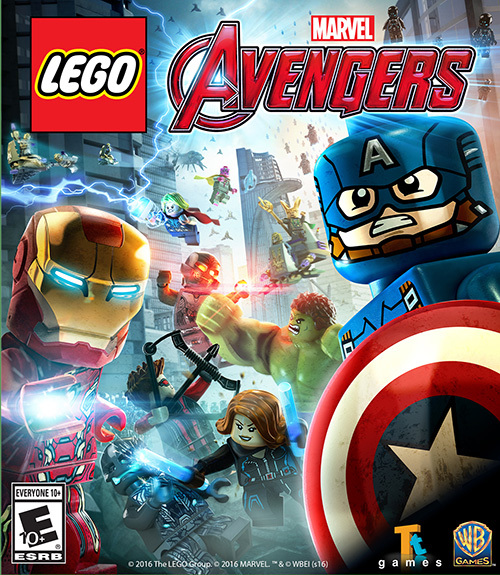 LEGO Marvel's Avengers might seem a step back compared to the innovative and fresh new things the developer's own LEGO Dimensions is doing, but if you're looking for the gaming equivalent of comfort food which is good for the whole family, then take out a controller and have a healthy helping of LEGO goodness.